today my blog is 6 months old AND it has reached 100 followers, so I’m hosting a very special giveaway to thank YOU, my amazing followers. The giveaway is open INTERNATIONALLY and it runs from today, Saturday, September 1st to Sunday, September 16th 2012. 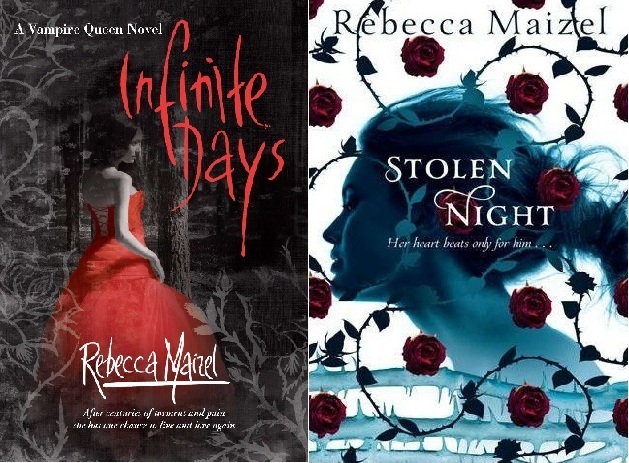 ONE lucky winner will receive the TWO following books: Infinite Days and Stolen Night by Rebecca Maizel. Both books are new paperbacks (UK edition). If you have been following my blog for a while, you know that I LOVE Rebecca’s YA series The Vampire Queen. I was lucky enough to do an interview with her a few months ago (you can read it here) and when Stolen Night finally came out in the UK in July, she OFFERED to send me a copy for myself AND a copy for a giveaway. That’s how amazing she is. So in case you’re not convinced yet, I’m offering you a chance to read her awesome books. Stolen Night won’t come out in the US until January 2013, so this giveaway is open internationally. And you can visit Rebecca’s website here and her blog here. To enter please fill in the contact form below with your name and email. You HAVE TO be a blog follower to enter. Please state if you follow by email, WordPress or RSS feed. If you’re a Twitter follower , if you like my page on Facebook or if you tweet about the giveawau, this will grant you an extra entry. Mention it below. This entry was posted in Uncategorized and tagged 100 followers, blogaversary, book giveaway, EM Castellan, Giveaway, Infinite days, Rebecca Maizel, Stolen Night, The Vampire Queen series, Vampire books, YA Books, Young Adult literature. Congratulations on hitting 100 followers & thanks for the amazing giveaway! Well congratulations on 6 months and 100 followers… not a huge step to successful query and pending publication! I’ve really enjoyed your blog (and twitter account) – both as a fellow fantasy writer and a reader. Best of luck for the next 6 months! Hi, I am a new follower here, nice to meet you! Congrats and thank you for the giveaway.